Sandeep D. Alva, Managing Partner, Portfolio Manager, founded Falcon in July 2000. 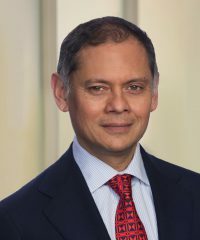 Mr. Alva was previously the President of Hancock Mezzanine Investments, LLC and Senior Managing Director and Mezzanine and Private Equity Team Leader of John Hancock’s Bond & Corporate Finance Group. While at John Hancock from 1985 to 1989 and 1991 to 2000, Mr. Alva executed numerous private market transactions, with an emphasis on mezzanine and private equity investments. In addition to his time at John Hancock, he also worked at the investment firm of Joseph, Littlejohn and Levy from 1989 to 1991 where he was a Principal involved in the acquisition of operationally and financially distressed companies. Mr. Alva has served on the Board of Directors of numerous companies, including current portfolio company American Achievement Corporation, Arca Holdings and Centerfield Media. He also serves on the Board of Trustees of The Holderness School, NH and the Board of Advisors of Titagya Schools, Ghana. He received a Bachelor of Commerce degree from Bombay University and an M.B.A. from Cornell University.